Following up on the release of the recent “Ivory” colorway, another adidas Originals YUNG-1 enters the scene, this time in a size? exclusive “Craft Ochre” colorway. A reconfigured version of the original Falcon Dorf training shoe from 1998, the updated Yung-1 is strikingly accurate in appearance as far as retro releases go, albeit with a few branding tweaks that take the shoe away from the performance category and bring it into the Originals family. The first time around the Falcon Dorf sat in amongst an assortment of memorable shoes from the same era, including the Galaxy in all it’s different iterations, and runners from the iconic Equipment range. Returning in a slightly different guise for 2018, the Falcon Dorf’s influence is noticeable in the uppers, with the only obvious differences being the restructured tongue and removal of performance branding. Torsion technology sits inside the midsole, as it has done since the 90s, to provide support underfoot and improve cushioning. This latest size? exclusive colorway offers a vibrant version of the silhouette. Rich shades of orange coat the shoe’s premium nubuck, suede and mesh uppers, and these striking shades continue to envelope the entirety of the midsole and gum outsole. The size? Exclusive adidas Originals YUNG-1 “Craft Ochre” drops October 20 exclusively at size? Highsnobiety x Diadora N9000 "Eastern Bluebird"
After helping Diadora commemorate its 70th anniversary with a special collaboration dedicated to Highsnobiety’s hometown of Berlin, part two of this joint celebration pays homage to our second home in New York. Releasing exclusively at Highsnobiety.com on October 24, the New York-inspired N9000 design comes by way of frequent Highsnob collaborator Hikmet Sugoer who looked beyond our office’s urban landscapes to the vast wilderness just outside of the city and happened upon the official bird of New York State—the Eastern Bluebird. 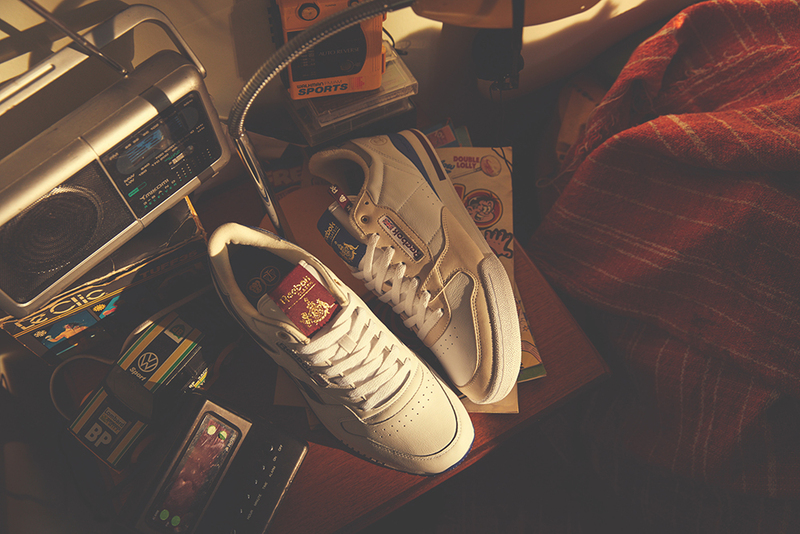 Our N9000 features a distinct blue color palette with the bluebird emblazoned on the insoles and hits of peach nectar along the side panels for a truly unique ode to the Empire State. Inspired by the phrase "Publicity. Publicity. Wohoooow!" Patta’s latest collection with Nike features multiple creative expressions including apparel, footwear and a campaign for which they collaborated with a group of 11 artists. “Traveling. Visiting each other. Getting to know each other. For us, that is where the collaboration between Nike and Patta started,” explains Patta’s Vincent Van de Waal. The phrase, "Publicity. Publicity. Wohoooow!,” stems from another sort of collaboration — the spontaneous “happenings” of 1960s avant garde artists, like Amsterdam’s Robert Jasper Grootveld. For the Patta crew, these engagements remind of a need not just for self-awareness and irony, but as Van de Waal notes, about how wearing overtly branded items becomes an act in space in and of itself. Releasing October 20 at Patta. The first ASICSTIGER x Solebox collaboration now dates back 10 years – an explicite reason to celebrate and honor the classic. That’s why Solebox teamed up with their Japanese friends from Atmos to create a new product on the Gel-Lyte III silhouette launching on October 13th. The collaboration merges the DNA of both influential partners: While Atmos gives the model its own twist through its striking signature snow-tiger-camo pattern, the grey and purple color-scheme reflects both the urban Berlin vibe and the heritage of ASICSTIGER x Solebox collaborations. Coming from the 2008 Solebox collaboration “The Sun“, parts of the upper further change their color to bright purple once hit by UV light, further used as accent color. Some upscale details accomplish the conspicuous design. The lace-tips as well as the backside got printed with both an atmos and solebox logo while the sole is partially icy on the heels and further features embedded emblems. The Gel-Lyte III comes with a smooth leather lining inside which ensures an exclusive appearance and provides convenience while wearing. Releasing October 13 at Solebox. This October, for the first time, HANON are proud to come together with KangaROOS and debut their HANON Coil-R1 ‘Moonshine’. 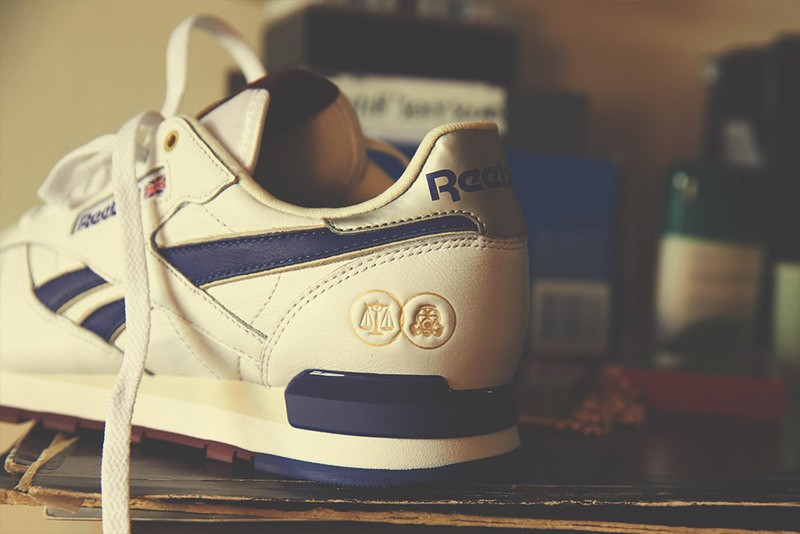 Known globally for their ‘Original Shoes With Pockets’ they have reworked the KangaROOS ‘86 Coil-R1 runner in a premium execution. Handcrafted in Germany at the Kangaroos factory in Pirmasens, our interpretation of the Coil-R1 is inspired by the one-time illegal production of alcohol in the US - commonly known as Moonshine! Originally produced at night and under the cover of darkness, Moonshine was distilled in makeshift copper pots and typically made by fermenting corn mash to produce a high-proof clear whisky. Notoriously unsafe and depending on the reliability of the distiller and apparatus used, lead poisoning and blindness were often a result of a poorly made batch. The volume of alcohol in the liquid could be tested by shaking a clear container. Large bubbles indicate high alcohol content and small bubble low alcohol content whilst a flame test could also be implemented to check for lead and other toxins! Utilising premium materials and handcrafted German production, our Moonshine edition of the Coil-R1 features a plush suede upper with contrasting cracked overlays and a full leather lining. Moonshine references appear throughout the shoe - highlighted via the tan colour to depict the mash, contrasting teal pops representing the oxidised copper on the stills, and patterned overlays to illustrate the bubbles in the liquid. Additional attention to detail appears in the rustic zig-zag stitches the tongue patch and footbed whilst the ‘illegal batch’ is depicted in an individually numbered edition of 408 pairs. Finally, the coil-R1 is sat atop a DYNACOIL sole unit - a patented NASA tested shock absorbing material making the Coil-R1 out of this world comfortable. Releasing October 13 at HANON. Following in the footsteps of the "Bred Toe", Jordan Brand presents another black toe style OG Retro 1 silhouette this season with the "Court Purple" rendition. The latest design features a combination of smooth and tumbled leather across the upper, sitting atop a rubber outsole. The upper features a predominately black and court purple color blocking with contrasting white quarter panels. The tongue features a court purple nylon tab with a white Nike Air branding, while the ankle features the traditional wings logo in black to finish the sneaker off. Coming soon at selected retailers such as Feature. adidas announce their latest collection celebrating the legendary global anime series Dragonball Z. With three of the most iconic battles re-imagined in sneaker form, the collaboration features seven silhouettes from the adidas Originals roster, carefully chosen to represent the characteristics of the heroes and villains to which they refer. First up is "Frieza" & "Son Goku" head to head. Deploying the latest adidas Yung 1 & ZX500 RM silhouettes. Each shoe is crafted to authentically pay homage to the character. Releasing September 28 at selected retailers such as hanon. 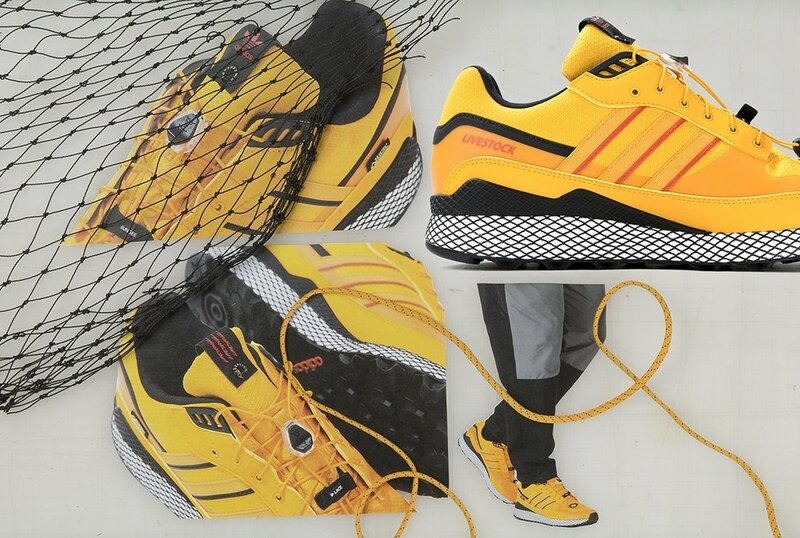 But the EQT line meant much more than running, as it covered the gamut of footwear categories and athletic needs. 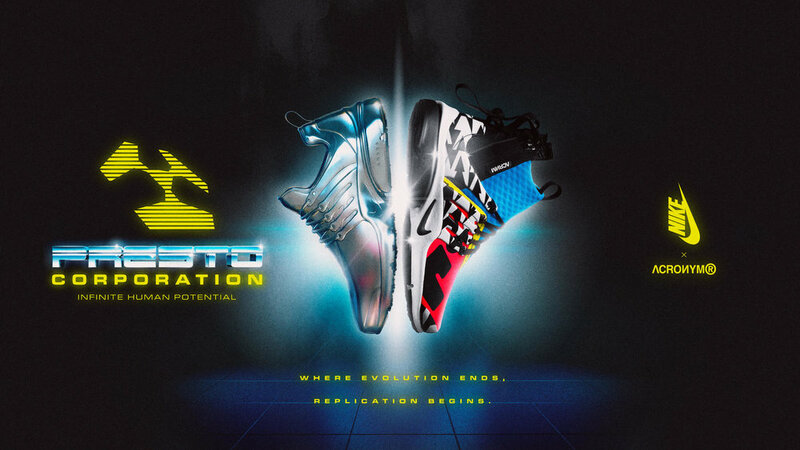 One of the true high-points of the early EQT output was the “Adventure Equipment” line, featuring a full range of rugged outdoor footwear options that not only demonstrated the versatility of the brand’s new direction, but also introduced a wider spectrum of colors and materials. The Packer x adidas EQT ’91 celebrates the classic EQT Adventure palettes by taking color cues from archive models to create an homage to this seminal era of adidas footwear. The shoe features a combination of premium suedes and leather complemented by heavy duty mesh and technical synthetics. Limited to only 250 pairs and available exclusively at Packer on September 22. CONSORTIUM4D is a concept shaped by light, liquid and oxygen. Combining the worlds of the natural and the technological to birth a shoe unlike any other. Featuring the world’s first high performance midsole crafted with light, liquid and oxygen. Its single component design is precisely tuned for controlled energy return, providing lasting cushioning and stability for any activity. Pioneered by carbon this breakthrough 3D printing process transforms liquids into solids. The adidas Consortium 4D / Footpatrol shoe draws inspiration from the theory of colour harmony. Using the colour wheel as a guide during the design process, FP selected an array of tertiary and secondary shades of green that blends harmoniously in a knit construction. The three-stripe Adidas branding features on both the medial and lateral panels of the shoe, screen printed in White on the medial and Black on the opposing lateral. Embroidered thread is stitch in a block form overlapping the knitted upper and synthetic suede heel counter. The Footpatrol Gasmark logo is situated on the embroidered Consortium label loop and heel of the footbed. The shoe is completed using a Continental rubber outsole for added traction. Releasing September 21 at Footpatrol. Livestock’s collaborative history with adidas stretches back to September of 2008, when they released the adidas Consortium x Livestock ZX 450. The relationship has continued as the years pass, coming together to design the Livestock Pureboost ZG, and the Samba in 2016. Marking ten years since that first Consortium collaboration, the upcoming adidas Consortium x Livestock Ultra Tech GTX and Terrex Skychaser are crafted to reflect their lifestyle and surrounding. More information about this release coming soon. 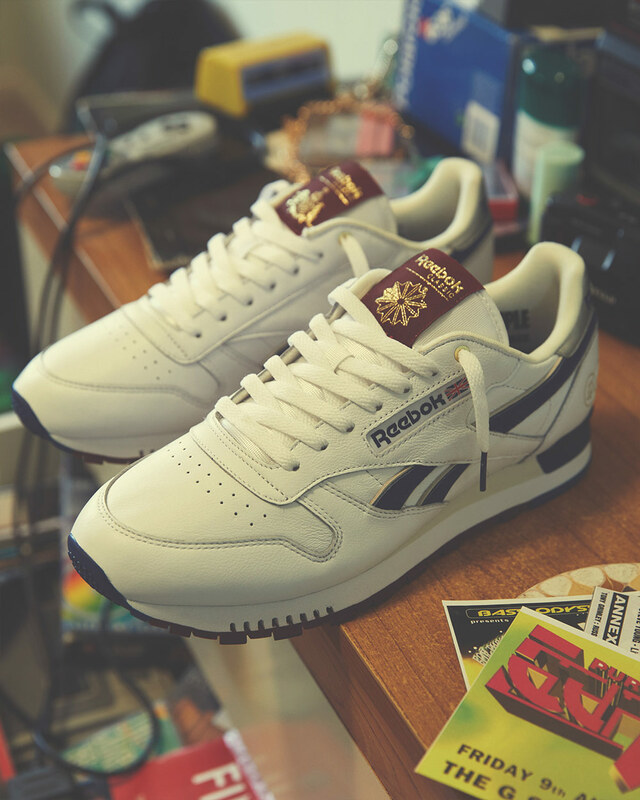 Introduced in 1985 of the legendary Reebok Club C 85 is the source of inspiration for the first collaboration work between Reebok Classic x OVERKILL. Referring to their team members memories of East Berlin in the 80s OVERKILL put a lot of love into details. Starting with different inlays which are strongly influenced by the colorful pattern mix trending at that time. Inspired by the characteristic designs of wallpapers tablecloths or floor patterns all together they recreate a typical living room atmosphere. The processing of a butter-soft upper leather with its ivory shades is as on fleek with color trends of mid-80s, as the green corduroy from which the tongue is made. “Berlin 1985” in the heel area, or the embossed co-branding on the upper and the woven tongue label OVERKILL is restaging the vibe of former East Berlin. Based on the well known sector signs that lined the streets during Berlin’s division, the labels on the insoles indicate when you are leaving or entering the “Sector Overkill“. On the tonal lace-keepers made out of soft rubber you can read the pun „Bückware“. In the former GDR Bückware stood for strictly limited and barely accessible “hot goods“ which were often traded only beneath the counter. To revive that feeling OVERKILL is hosting their first extern and global exclusive release combined with a GDR theme party at Klub der Republik, an old-established club in East Berlin. Not only the use of contemporary materials and associations from East Berlin underline the authenticity of the project. Especially the special GDR boxing is: A tawny flap box in which the silhouette is wrapped in a then classic, loose-knit shopping bag. Releasing exclusively at OVERKILL on September 23. Sneakersnstuff are proud to announce the follow up release of the 2017 critically acclaimed Datamosh Pack with adidas Originals. The second rendition of the pack, Datamosh 2.0, is inspired by the technology known as datamoshing - a process of data corrupting and manipulating where moving images are being moshed together to achieve visual effects. Releasing September 22 at Sneakersnstuff. Tokyo native and seasoned Nike partner and collaborator Jun Takahashi has long been revered as one of fashion’s most influential designers; his eponymous clothing label UNDERCOVER has been a staple of cool-kid closets since he founded the brand in 1990. Takahashi first partnered with Nike in 2010, and since then the fashion icon has added his touch to several Nike staples, including his renowned Nike Running partnership, Gyakusou. 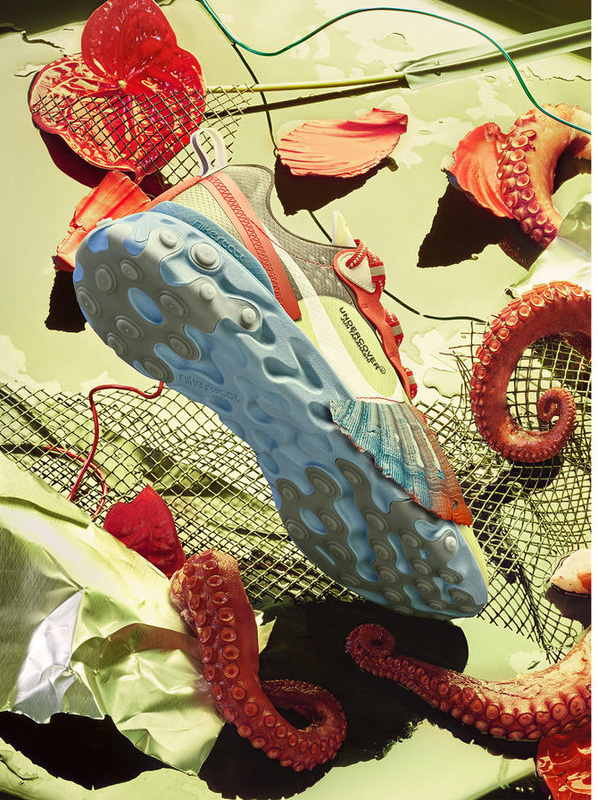 For his latest collaboration, Takahashi brings his unique UNDERCOVER irreverence to the Nike React Element 87. 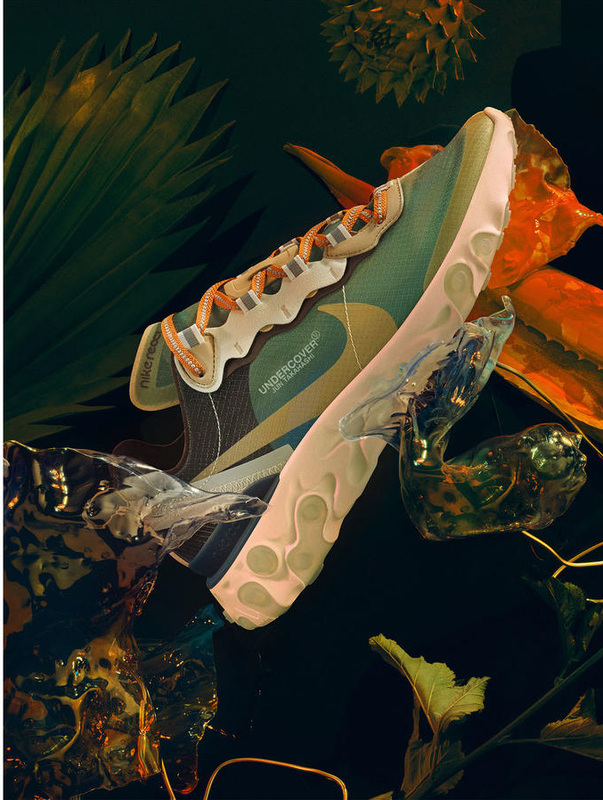 Debuted on the UNDERCOVER runway at Paris Fashion Week Fall-Winter 2018, the Nike React Element 87 x UNDERCOVER takes inspiration from heritage running shoes like the Nike Internationalist, adds reflective and transparent details and places it all on Nike React foam. Signature UNDERCOVER branding and a whimsical dose of color bring fresh dimension to a bold design. 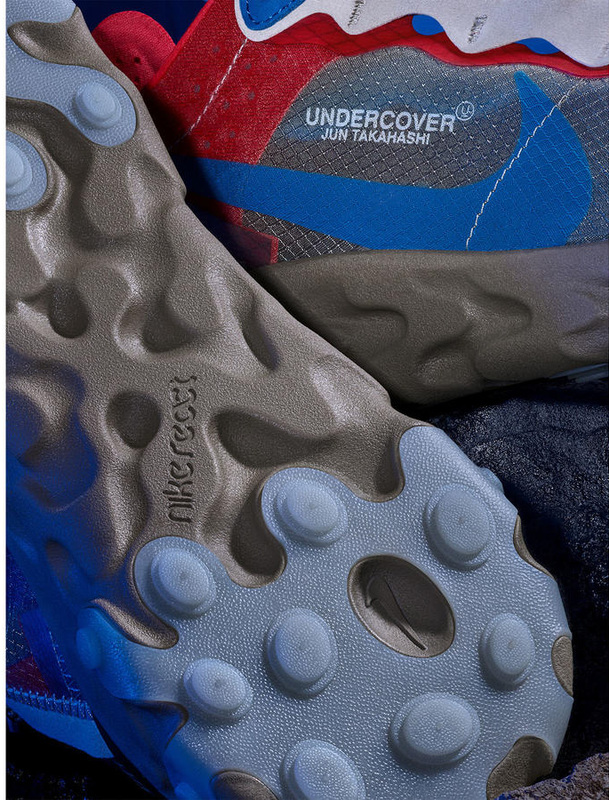 The Nike React Element 87 x Undercover is available September 13. Italian brand Diadora Heritage partners for the first time with Marc McNairy, the American fashion designer known for his complete devotion to craftsmanship. McNairy’s iconic combination of fresh Californian style and bold military mood meets Diadora Heritage classics and the brand’s exquisite savoir-faire for a collaboration that pivots on capturing the strongest elements of both. 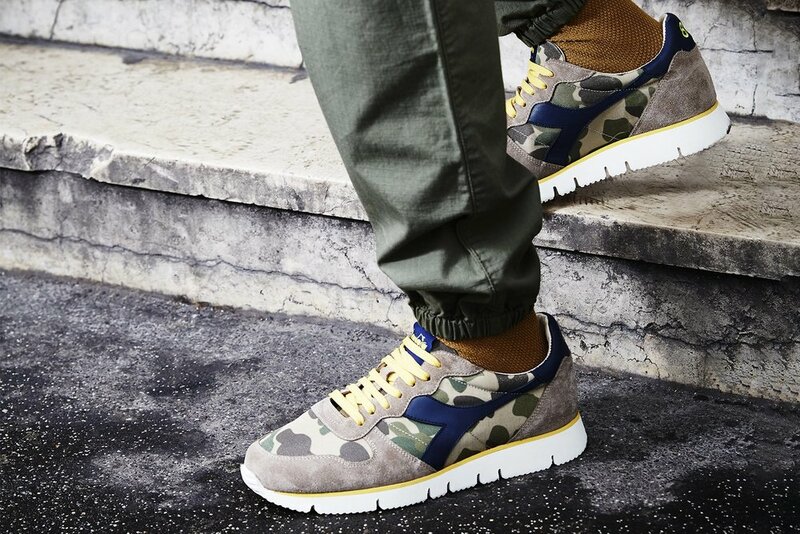 The KangaROOS Coil R1 “Mighty Forest” is a handcrafted sneaker Made in Germany. The upper is made of premium calf suede and calf leather. The lining contains a mix of materials, namely mesh and leather.And with the anti-bacterial, breathable and lightweight leather insole, your feet will stay air-cooled and fresh. The premium materials in combination with the NASA tested Dynacoil cushioning system make this sneaker a true premium product. And because it is made by KangaROOS, it features, of course, the famous pocket in the tongue. It comes in a Programme for the Endorsement of Forest Certification Schemes (PEFC) certificate wooden box. Limited to just 300 pairs . For each sold shoe, Afew will plant 10 Trees together with Plant-for-the-Planet. Releasing September 15 at Afew. First released in 2016, the Acronym x Nike Air Presto Mid echos designer Errolson Hugh's utility-focused ethos. The zippered collar allows for easy on-off functionality, while the classic mesh upper and midfoot overlays evolve the support structure of the original 2000 Presto. For the second trio of Acronym x Nike Air Presto Mid releases, Hugh pulls a bold tech-inspired color and graphic scheme. 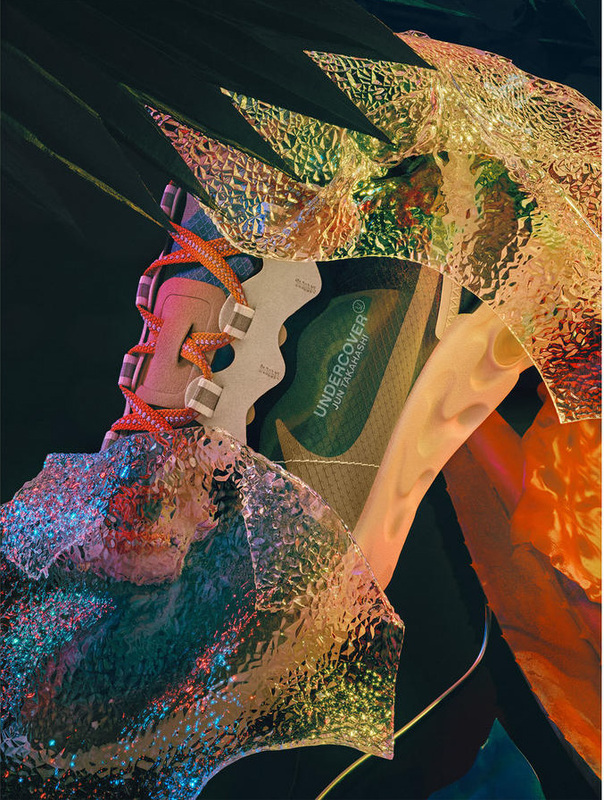 This gives the silhouette a new twist, and one connected to the current "visual projects" Hugh is undertaking by twisting his brand's signature "A" into a camouflage pattern (similar to what was employed on the recent VaporMax Moc 2 x ACRONYM®). Releasing at selected retailers on September 20. The Reebok Phase One Pro upper is dressed in a mixture of premium vintage leather along with Cream nubuck overlays. 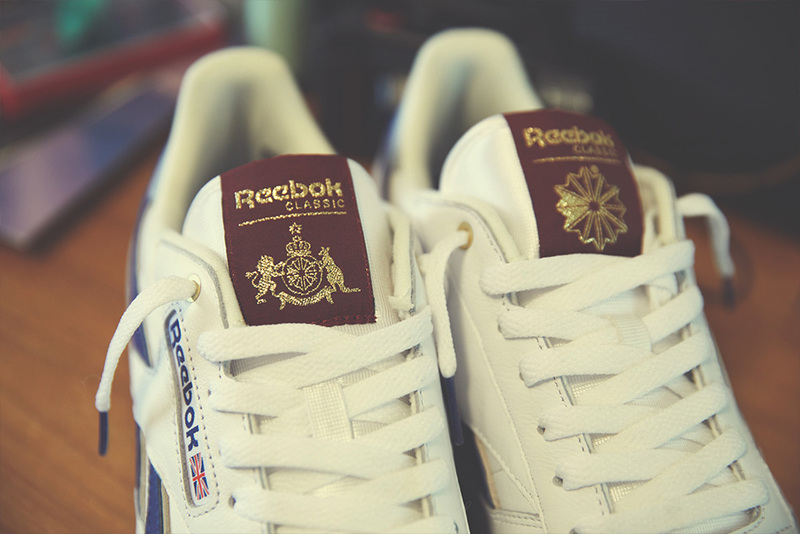 Reebok’s signature crest logo on the tongue tab done in Navy and Gold. Detailing includes a Gold dual branded logo lock up on the heel, heel counter in Silver as well as a repeat logo pull tab throughout the tongue. Additional two sets of flat laces (White with Navy aglets / Cream with Burgundy aglets) are included. The Footpatrol / HAL ‘Common Youth’ collection releases August 24. at Footpatrol and HAL.